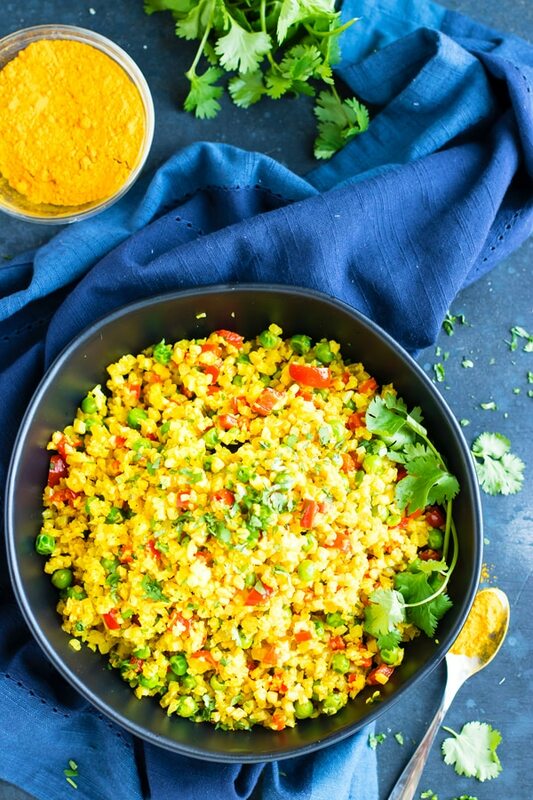 Curry cauliflower rice is ready and on the table in under 15 minutes! 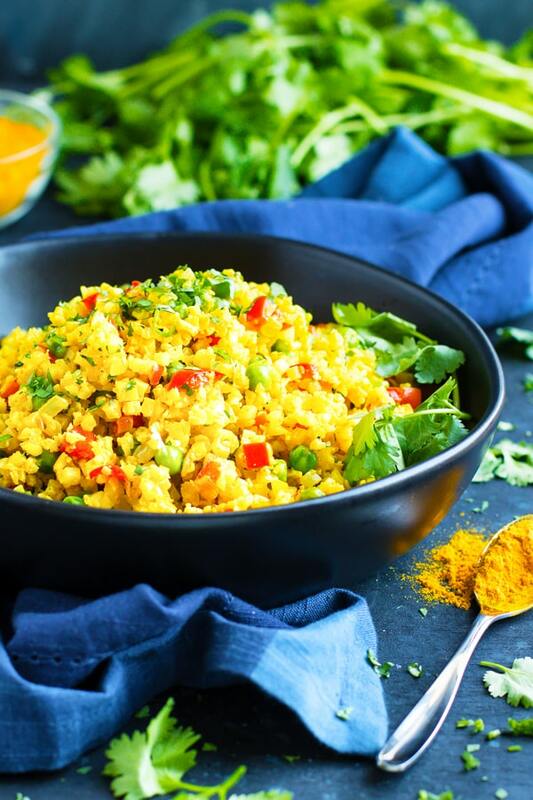 This vegan, whole30, ketogenic and Paleo side dish recipe is so easy to make by using frozen cauliflower rice and a few go-to Indian spices. Who here has made cauliflower rice in a food processor? Lemme’ see those hands! Is it just me, or did those little granules of cruciferous-ness end up ALL over your kitchen? Not to mention, the tediousness of cleaning out your food processor when all is said and done. 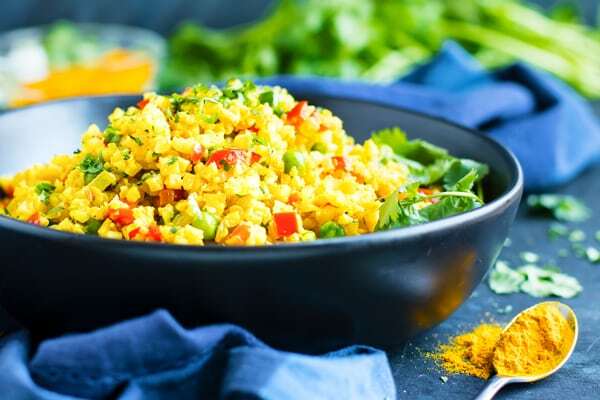 While it might be a bit more expensive than buying a head of cauliflower, frozen cauliflower rice is an absolute lifesaver when you are in a pinch for a quick and healthy side dish. All you have to do is let it thaw for a few minutes, break apart the ice clumps, and toss it in your skillet. 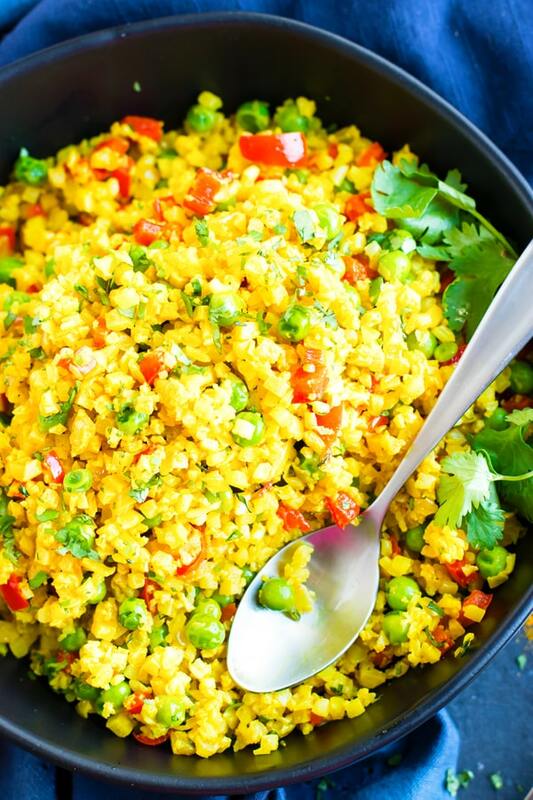 You’ll have curry cauliflower rice in under 15 minutes! A Vegan, Whole30, Ketogenic, and Paleo Cauliflower Rice Dream! This curry cauliflower rice is so simple and is made from REAL food ingredients. Cauliflower, bell peppers, and onion make up the bulk of the recipe. All natural ingredients, and ALL nutritious for you. Because of this, it is one of my new favorite vegan, whole30, Paleo, and ketogenic recipes! What Kind of Cauliflower Rice Should I Use? While I mentioned using frozen cauliflower rice, you can also always make your own or buy it in the pre-chopped vegetable section. For the frozen cauliflower rice, I have used and love Bird’s Eye, Green Giant, and Cascadian Farms brands. Trader Joe’s, Green Giant, and a few other local companies also make never frozen cauliflower rice you can buy in the produce section. If you do this, you won’t have to thaw frozen cauliflower rice before beginning. 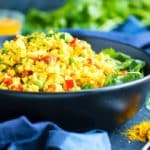 What Can I Serve with this Curry Cauliflower Rice? Honestly… Cohl and I ate this curry cauliflower rice alongside a pretty boring baked chicken breast. The cauliflower rice is already bursting with loads of spicy flavors, so a simple main dish will compliment it nicely. Not into meat? You can always add chickpeas or tofu into the cauliflower rice to give it some added protein. How Can I Evolve this Curry Cauliflower Rice? You can add a bit of coconut milk to make the cauliflower rice a little more tender. Add a pinch of cinnamon to give the rice a touch of sweetness. Switch up the vegetables by adding carrots or different colored bell peppers. Leave out the peas for a Whole30 and strict Paleo diet-approved recipe. Let cauliflower rice and green peas thaw at room temperature for 10 minutes before using. In a medium-large skillet over medium heat add 2 tablespoons oil, bell pepper, and onion. Saute for 4-5 minutes. Add garlic and saute for another 1-2 minutes, or until garlic begins to brown slightly. In a small bowl mix together curry powder, turmeric, coriander, and salt. Add thawed cauliflower rice, peas, and seasoning mix to the skillet. Cook for 5-7 minutes over medium heat, or until cauliflower rice is cooked to your desired tenderness. *Leave out peas if on a Whole30 or strict Paleo diet. 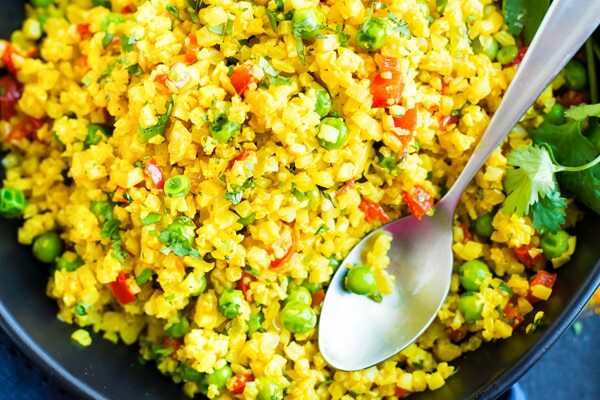 Want more recipes like this Curry Cauliflower Rice? Excellent. Thank you. I found it tastes even better after a day in the fridge.